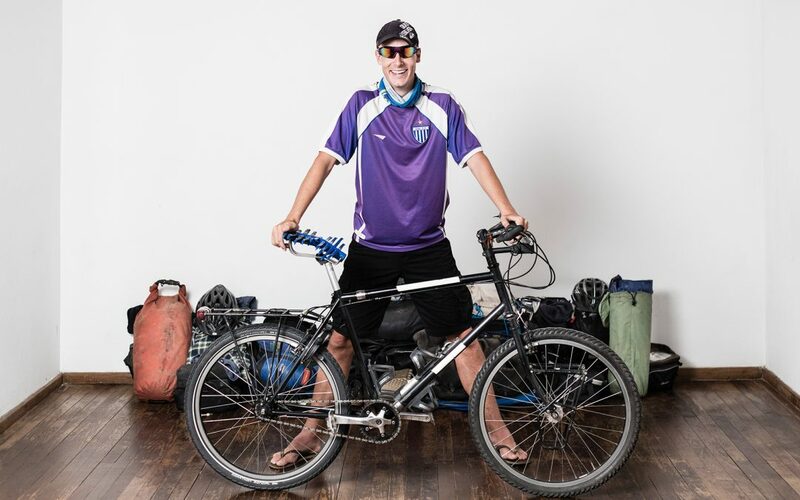 In 2011 Dominic took off for a few years – six and counting – to tour the world on a bike. In 2014 he discovered the Manta saddle and is still on it. Here’s his take on what makes the Manta so special. ‘Long-distance tourers store their things in Ortliebs, put Schwalbe Marathons on their wheels and sit on a Brooks B17. That was how the world seemed back in 2010 when I started buying things to go on my tour. Knowing not much, I decided that everyone else probably knew best. I picked up a complete set of Ortliebs for my stuff and a B17 for my bum. Six years later, I’m still using Ortliebs and I see no reason to use any other panniers. The B17 lasted about a year. I then moved on to a Selle-Anatomica (a B17 with a slit down the middle) which initially proved to be marginally better, but over time started to lose its comfort. In January 2014 I was looking at different saddles and stumbled across Manta saddle. Like everyone who sees it for the first time, I was taken back. I couldn’t really understand how it was meant to be a saddle, but I was intrigued and did some research. I found some information online that spoke positively about it and I contacted Jon Catling, the Manta’s designer. I was immediately impressed by his positive attitude and took up his offer to try the saddle out when I was back in the UK in April 2014 for my Granny’s 80th birthday. Unpacking it, it managed to looked even stranger ‘in the flesh’ than it had online but that didn’t dent my intrigue. It took a short time to get it set up the first time, mainly because the seat-pin needs to be about 8cm (3″) lower than it had with my regular saddle. That means you need to have enough height on your seat post to be able to drop it that far. ...it took a while to realise the next thing, and that’s because it was an absence. Once it was approximately in the right place, I jumped on and went for a ride. The biggest thing that you notice is the feeling of the bottoms of the thighs being pushed up. This is going to always be there, but it gets minimised by the right angle. After getting used to that it took a while to realise the next thing, and that’s because it was an absence. Saddles involve pressure, and after riding long enough you get a sore bum. On the Manta you don’t. Because the surface area is so large, the amount of pressure is reduced massively. After a short test ride, Gaz and I went for a three-day tour. I used the Manta, he used my old saddle. Gaz isn’t a cyclist and after the first day found my old saddle to be hugely uncomfortable. His bum was in massive pain. I had none. On day two, we swapped saddles. A day of riding the Manta was enough to spoil me. My old leather saddle – which I’d ridden more than 25,000km on – seemed uncomfortable. Gaz, on the other hand, was delighted. The Manta was probably the main reason he managed to ride on that second day. His only problem with it was because his bike was too big for him, he couldn’t lower his post enough to make the Manta not wobble when he was riding it. But even being too high it was more comfortable than the Selle-Anatomica. I was sold on the Manta. In supporting your whole bum and upper-thigh area it manages to reduce the pressure you feel down to pretty much none. I’d say that one of the main reasons people don’t want to ride a bike, along with a lack of safety due to poor infrastructure, is comfort. There’s the idea that you have to dress up in lycra, which doesn’t appeal to most people, and that you’ll get a sore bum after a few miles. Looking at the number of products aimed to reduce your bum pain, be it fancy shorts with chamois pads in them, to all the funnily-named creams that you’re supposed to apply, this is a big issue. The Manta was designed with this in mind. In supporting your whole bum and upper-thigh area it manages to reduce the pressure you feel down to pretty much none. I’ve been using it for three years, or almost 40,000km, and the number of times I’ve had saddle sores is only marginally higher than the number of unicorns I’ve seen. (In Spain, when I was trying out a different saddle for a short time, I found I preferred standing up all day to using a non-Manta saddle). The comfort is of course the main reason to choose a Manta, but there are a couple of other things I like about it. The first is how fantastic an icebreaker it is. Very few people have ever seen a Manta, even in the cycling community, and so wherever you are people will want to try it and ask you about it. I can’t count the number of times I’ve been asked what it is by people who couldn’t work it out, even though it’s obviously where a saddle should be on a bicycle. On multiple occasions people have seen the saddle while I was riding by, caught up with me and then started a conversation which led to them offering me dinner and a hotel. I never had that happen with my leather saddles! Overall, I wouldn’t ride any other saddle. Another great thing that builds on people not knowing what it is, is the security it offers. If someone is going to steal a bike, they’d like to be able to ride away on it usually. That’s something people probably wouldn’t feel confident doing with the Manta (even though it’s simple to ride) and that’s great for me. Having said that, life hasn’t been all roses with the Manta. I had issues with the metal rails on multiple occasions in South America. While that has been frustrating, Jon Catling has been incredible. Each time I’ve had an issue it has been resolved promptly even when Brazilian and Peruvian customs have done their best to stop it. Jon has not had other customers have issues with their rails, and since we made a design modification to mine they’ve been problem free for a long time too. The only other issue with the Manta that I’ve had is a very minor one. The Manta is made of 9 elements, and when you’re not sitting on them the way they maintain the shape is through a series of small ‘teeth’ that interlock to the next element and keep it in a perfect wave. You might have noticed in some of my pictures that this isn’t the case and that’s because the teeth wear out after 20,000+km. This is purely cosmetic, but it’s a small annoyance.